Scrangie: Random Black Polish Swatches and Comparisons! I've been working really hard on my swatching project lately and I feel like I'm finally making progress on the giant mountain of polishes I wanted to photograph. Yay!!! I've actually been working on photographing my entire stash for quite some time, but the problem is my collection keeps growing. That, and I get distracted very easily lately... But wow! Progress feels awesome! Zoya Suvi compared to China Glaze Gussied Up Green. Index and middle finger are Suvi, ring and pinkie are Gussied Up Green, thumb is (left) Suvi and (right) Gussied Up Green. You can see that while they're quite similar, they're definitely different enough to justify owning both. Love 'em! Red glitters! 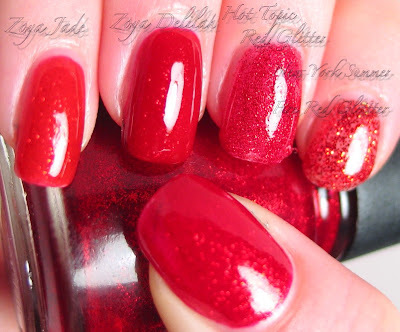 Thumb to pinkie: China Glaze Ruby Pumps, New York Summer Fire Red Glitter, Hot Topic Red Glitter, Zoya Delilah, Zoya Jade. All quite different! And all very pretty. I still haven't quite figured out the text thing yet, but I'll figure something out! And there's recently been a lot of interest in black nail polish, so I've swatched a few. Wet N Wild Fantasy Makers Black Pearl. No, it's not pearly, it's creme.... Weird name lol. Black Rose. It doesn't have a label so I don't know the actual name or brand, but I found this on the Fantasy Makers halloween display at Walgreens! Orly Goth. My favorite black with silver glitter. The glitter shapes are somewhat random and it reminds me of snowflakes. Petites Black Star. Gorgeous black and gold glitter! Hot Topic Black Glitter. No label so I don't know what the actual name or shade number is, sorry! Hot Topic Black Iridescent. This is one of the coolest polishes ever. It's full of little flecks of multicolored glitter- they change to all the colors of the rainbow depending on the light! It's unbelievable. If you like black polish, you MUST get this one- it's only $2.99! Chanel Black Satin. If you're thinking of getting this, don't. Get Zoya Raven instead! It's identical and costs $6. Zoya's formula is better, too! 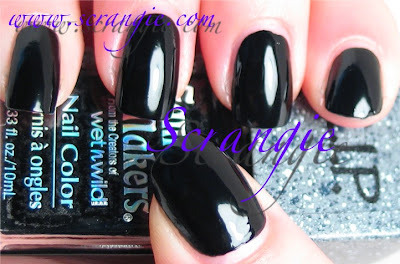 ManGlaze Black. I adore this. Misa Wishing On A Star. These are just a few of the black polishes in my collection. If there's a specific black that I haven't posted and you'd like to see it, let me know and I'll be happy to post it for you! Oooh! All those black polishes look amazing! Then again, all polishes seem to look great on your nails! Okay, I have a comparison request, but it's not for black ones. Could you please compare OPI Espresso and OPI I'm Fondue You? I'm having trouble decide on which one I should get. I would greatly appreciate it. Thank you so much for the Suvi and Gussied Up Green comparison! I just picked up GUG and am still considering Suvi. GUG is more shimmery but the colors still look very similiar to me. Sigh, I'm still on the fence, but I really do appreciate the swatches! The Fantasy Makers display I bought my roses from identified it as the Wet 'n Wild Deadly Rose collection. I think they are just called Red Rose and Black Rose. I would love to see a Chanel Noir Ceramic comparison and ditto on the brown comparison (but please include Borghese Espresso Brown). Awesome swatches. Black Iridescent from Hot Topic looks FAB! If it weren't for the ridicilous shipping cost, I'd have a small storage filled with that one already! ManGlaze Black looks awesome too. Where could I find one of these? Oh!!!! Hot Topic Black Iridescent looks fantastic! and oh my, that rose bottle! Crying like a baby because I want them! omg - black black black, i want them all :D (changed my username but not my love for that color *g*). The wet and wild polish is really cool. i like it a lot! also Orly's polish was great. Loved your post as always! Sorry Scrange, black is not for me! Nice swatches though. It's bad enough when I wear my 'almost black' blue's, green's and purple's; that my second grade students say "Your nails are black"
Stubby, hehehehe! I get those comments too when I wear those types of colors- drives me batty! I have to argue with people, "No, it's blue, yes, really, it is BLUE I'm not making this up!!!" Anyway, thank you very much for posting so many swatches. It certainly makes picking out colors that suit me much easier. I do have one question about the blacks: How did each one fare as far as coating to opacity? I often use black for layering, and don't want to pick a new one up that's too thin and needs three coats. As for opacaity, all of the blacks pictured here are two coats. The Fantasy Makers Black Pearl really only needed one, which is so awesome because it's under $2- talk about economical! These all are around the same opacity, with a couple having more coverage on the first coat, but all needing a second coat. We must be on the same wavelength today because I just posted some comparison swatches of blacks and steel greys also. Although you have WAY more than me! These are all great, thanks! Thanks for the swatches - I love the red glitters; Im currently waiting for the CG Ruby Pumps to arrive! Awesome swatches as usual Scrangie! Does anyone know if Wet N Wild Black Magic is carried here in Canada? I have been stalking Shoppers' Drug Mart for it with no luck. I will also check out Rexall, but if anyone knows of a more reliable source, I would appreciate it! Thanks! Melli - I've had luck finding the WnW Fantasy Makers at London Drugs in past years. I can't recall having seen them at SDM though. The only Halloween stuff I've seen out yet is NYC at Rexall/PharmaPlus and SH at Zellers, Rexall, and SDM. Hooray, Gymnastgirly to the rescue!!! <3 Thank you SO much, I really appreciate that!! Oops...sorry gymnastgirly...I think I stripperized your name! Melli, LOL! :D Tooooo cute!! Do you think the red HT glitter is a must have, Scrangie? Is there an Essie black with glitter that is similar to Orly Goth...or am I just thinking of Orly Goth? I may be thinking of Starry Starry Night, which is of course, blue. 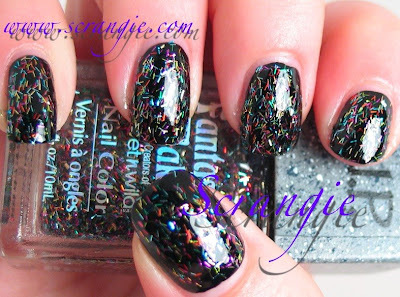 I want to get a glittery black for winter. I took a longish vacation from black polish when Chanel Black Satin came out. I was just overloaded. Philly is a black nail polish kind of town anyway and it was omnipresent for awhile. I just like to look at something different, you know? I enjoy the pleasures of variety. It's expensive. hey. thanks for the as-always-amazing posts. where's the "Hot Topic Black Iridescent" available thru? i'm in Canada and I wonder if it's an online brand?? Anonymous, you're very, very welcome! Anooshka, Hot Topic is one of those mall chain stores, like Claire's. They sell the polish on their website (http://www.hottopic.com) but I'm not sure if they ship to Canada or not! LoL. I have like seven bottles of that fantasy maker black Wet-n-Wild nail polish that I got for 20 cents each the day after halloween 2007! I agree that it's better than Black Satin (which I also have. My bff works for Chanel). I love the wet-n-wild because it dries fast and uber glossy. In the meantime, have you tried searching on Makeup Alley for someone who has one they would like to trade? I own a couple of black nail polishes myself (I'm always searching for the perfect black), and one that I think is fairly decent is Orly's Liquid Vinyl. It's seriously pigmented, and it goes on relatively smooth. I think the worst black nail polish that I've ever purchased is Deborah Lippman's Vinyl nail polish in Fade To Black -- it chipped the first day that I wore it (so much for eight bucks). The Man Glaze looks absolutely delectable! That's next on my list! Why the heck I had to come across this post after buying Chanel Black Satin that would have saved a lot of my money!!! Bummer!! !